Amazon Echo (2nd Gen) review | What Hi-Fi? According to the Chinese zodiac, 2017 was Year of the Rooster - but we’re inclined to suggest it’s also been the year of the smart speaker. Amazon’s aim to put Alexa into pretty much everything has come home to roost this year, in the shape of any number of voice-controlled speakers. Google Assistant is available through myriad devices, Cortana is aboard one or two, and Apple's Siri-powered HomePod has now been available a good few months. It’s fair to say you may well be talking to your next wireless speaker - if you aren't already. It’s only natural Amazon itself has reinvigorated its Echo range. There are four new Echo devices now available in the UK, each promising better sound and upgraded features. There’s the Echo Plus (£150), which focuses on increased smart home connectivity and better sound, Echo Show (£200) features a video screen, and the Echo Spot (£120) is a voice-controlled bedside clock complete with video calling. And this second-generation Echo can be yours for £90, some £60 cheaper than the original. So it’s cheaper. But what else is new? Somewhat confusingly, the 2nd generation Echo has a completely new design, while the Echo Plus looks the same as the old Echo. So what we have here is a squashed, trodden-upon Echo. But we say that in a good way. The stubbier design probably better blends into the average room, the new fabric finish makes for a more premium look, and there’s a choice of six colours (charcoal, sandstone or heather grey fabrics; oak, walnut or silver finishes). 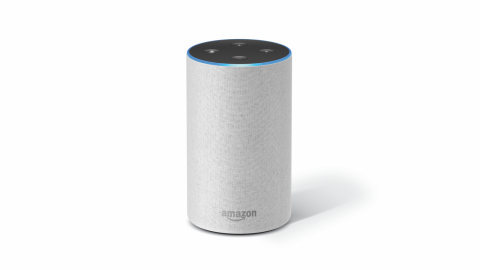 The top of the new Echo shares the design of the Echo Dot, with volume buttons rather than the dial found on the first-gen Echo. The mute and set-up buttons remain. There’s still wi-fi and Bluetooth streaming, but now also a 3.5mm line output at the rear of the second-gen Echo for connecting to legacy devices. Previously only the Echo Dot had this audio output. On the inside, there’s a new 65mm woofer and 15mm tweeter. Though much smaller than those of the previous model, Amazon suggests an upgrade in sound quality. That’s no doubt in part attributed to the “Dolby processing” on board here. As well as second-gen speaker tech, the new Echo also has the second generation of Amazon's far-field microphone technology. The key upgrades are said to include better processing of your wake word, and improved noise cancellation - which should make it better at hearing your commands in noisy rooms. Also new is Alexa Routines. Much like old universal remotes, it will allow you to program and control multiple Alexa devices with a single command. "Alexa, good morning" could signal your smart lights to come on, blinds to open and even your kettle to boil. Or just for your Echo to give you a weather report. Compatible brands include Philips Hue, TP Link and Wemo. Set-up is simple and intuitive via the Alexa app, though its usefulness hinges on the number of Alexa devices you have in your home. You can now call people using Alexa (provided they too have an Alexa device). Alexa calling and messaging promises to let you “drop in” and out of other people's devices, which sounds both impressive and slightly creepy. Once you sign up and enable drop-in you can listen (or watch with video-enabled devices). Everything else that makes Alexa and voice control interesting is still here, of course – tell the new Echo to play music from Amazon Prime Music or Spotify, get weather updates, football scores etc. We were underwhelmed by the audio quality of the original Amazon Echo. Although it was perfectly listenable, it played safe at both ends of the sonic spectrum. As a result, similarly priced but less well-specified wireless speakers were comfortably better. And in short, the second-gen Echo doesn’t change much. In fact, we prefer the sound of the old Echo. This new Echo may well deliver a little more bass and a beefier sound but, even compared to the original Echo, it lacks clarity. The overall presentation sounds muffled, with thick vocals and a generally cloudy midrange - as a result, detail is lost. The saxophone on Kamasi Washington’s Desire sounds a little raspy and thick, while the tippy-tappy drums lack the precision and insight you’ll hear from the larger Echo. But this new new Echo is 40 per cent cheaper than its predecessor. And you simply can’t get the Alexa functionality from any other speaker at this price (unless you count the Echo Dot, which isn’t much of a speaker at all). What’s more, Amazon is releasing regular updates to its devices, meaning it can (and already has, in fact) adjusted the sound quality. Crucially, the microphone performance is notably better on this Echo. In our experience, not only is it more likely to understand your command but it’s also better at hearing commands in noisy environments. We don’t need to raise our voice to make ourselves understood with the second-gen Echo, while the original at times requires child-scolding levels of shouting to respond to commands. And will most people hear Alexa’s voice more often than they play music? Possibly. The new Amazon Echo is cheaper, looks smarter and is better at hearing your commands than the original, but the sound quality remains so-so. Provided you don’t expect more for your £90 - and considering there isn’t an alternative for the money - the second-generation Echo remains a good buy. On the other hand, if your main priority is playing music, we’d suggest you look elsewhere.